Today's card is one that I made a few weeks ago for a swap over at Technique Junkies. I had to wait to post it until all the swap cards were traded out. The pumpkin is an Inkadinkado image. The sentiment is Hero Arts. 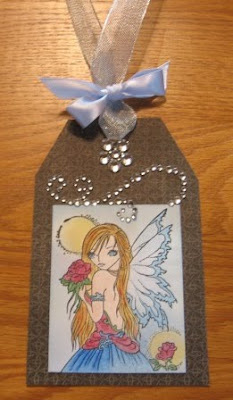 The background was made by taking a piece of lace, laying it over the cardstock, and spraying Glimmer Mist over it. Glimmer Misting was a lot of fun - if you haven't tried it, you should! Happy Sunday, and welcome to another challenge at Stampin' Sisters in Christ! Our hostes this week, is Miesje. She has chosen John 14:27, as her scripture: "Peace I leave with you; my peace I give to you. Not as the world gives do I give it to you. Do not let your hearts be troubled or afraid". Miesje's challenge for the week, is to use a Christian symbol of peace, or to make a card or project that shows or shares peace. 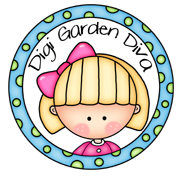 Our sponsor this week is Designed 2 Delight Digital Stamps. One lucky challenge participant will receive a $10 gift certificate to shop at Designed 2 Delight! For my card, I chose Heartfelt Wishes. This is just about the cutest snowfolk ever! nearly 80% of his body when our house burned. As you can imagine, this was a very intense situation for us all. he would be horribly disfigured. This week's verse is special to me, as it helped to carry me through the days of his healing. There were the skin graft operations, the emotional strain, and once we got him home, the daily wound debridment, all while I was several months pregnant. Many years later, this same verse continues to carry me through difficult times in my life - the two military deployments of DS, watching DD struggle through, and triumph over an abusive marriage, then move away to Asia for over a year, the loss of our parents and grandparents, etc. The glorious peace of the Lord, and the peace that this verse has given me over the years has kept me calm and sane for my family. I wish for all of you peace in this new week! Before I talk about 'business', I must talk about family! Our little town had a 50 years of Homecomings celebration yesterday. DD was Homecoming Queen in 1998. Here is a photo of she and her dad in the parade yesterday morning. There was a 'parade' on the field last night prior to the football game, as well. Past queens, band members, football players, etc. were all on the field. Here is a photo of her - she looked up at us just as I clicked! That never happens!!! 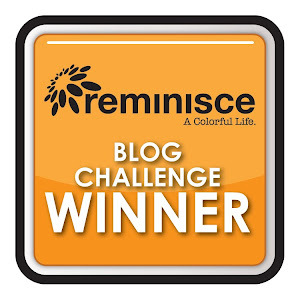 I've decided that in honor of my TWO whole years in Blogland, I'm going to give away two blog candies. I've also decided that the candies will be the same! Drumroll please..... both candies will be a $50 gift card to the on-line store of their choice! So... two lucky people will soon be shopping!!! This blog candy starts today, and will run through Friday, October 8th. The winner will be announced on October 9th! Good luck to everyone!!! Please do not feel obligated to do any of the above! You are all my friends, and I just want to do something nice for you! I wish I could give you ALL something! First, dear friends and followers, I want to thank you so much for hanging with me the last month or so while I've been traveling with dear hubby, and not getting around to your blogs. Some of you have been so faithful, never missing a single post. I feel so special, having friends that visit me, when I've been unable to return the visit! I would imagine by the end of next month, the weather will change, and I'll be back to normal, but thank you very much for continuing to drop by. I took a short walk a while ago, and peeps, this day is just delightful. It's 81 degrees, but there's a gorgeous breeze blowing, and right now, not a cloud in the sky. I hear that will change tonight! I think that since my blog will be two years old, that I should have 2 candies...what do you think? Maybe a big candy for followers, and a small candy for others? That way no one will feel obligated to become a follower??? Wow! I can't believe that my little old blog, that started out as a way for our kids to keep up with a bathroom remodel, has evolved into what it has, and that it will be two years old TOMORROW! Wowzers! Tune in tomorrow to see what you can win! Hugs and blessings to all!!! This darling image was one of four images that I won at For Fun Challenges a couple of weeks ago. It's by Sassy Studio Designs, and I thought she was absolutely perfect for this week's Pirate challenge at CCEE Stampers! What an exciting Sunday we had. We went to a neighboring city about 1.5 hrs. away to watch our dear daughter participate in her first half marathon. It was amazing how many people of all ages, body types, and physical condition turned out to run this race. It was also fun to watch the 'cheerleaders' for other runners. We spent a very nice morning, in beautiful weather conditions watching Melissa start AND finish this race. For those not familiar, a half marathon is 13.1 miles. The race officials said this course was actually 13.2. We are so proud of her for attempting and finishing. The course had many inclines, and some of the inclines were steady uphill for a long way. Anyway, thanks for listening to me brag a bit, and for looking at our photos. Crossing the finish line... the 5k runners and race winners were cheering on others as they finished. Happy Sunday, and welcome to another new challenge at Stampin' Sisters in Christ. 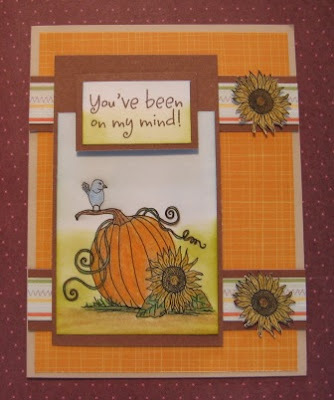 Chris' challenge this week is to use fall colors OR leaves on your creation. Our challenge this week is Sponsored by Our Daily Bread Designs. A lucky winner will receive a $15 gift card to shop in the Our Daily Bread store! My favorite season has to be fall. We live in an area with many hills, trees, valleys, etc., and it's almost overwhelming how beautiful it is when the leaves all begin to change colors. God is visible every direction you look, in every shade of red, orange, and brown. Here is my card. This set is from Our Daily Bread Designs, and is called Quiet Waters. You can find it here. The two deer were colored, then stamped and colored again. I fussy cut the second set, and layered them over the stamped images using dimensional dots. 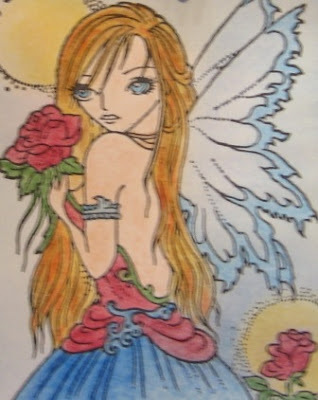 The sentiment is computer generated, DP is DCWV, and all coloring is done with Koh-I-Noor Pencils and LOMS. Nesties scalloped square dies were used on corners. I hope that you all have a day full of blessings. I also hope that Blogger cooperated and did the pre-post thing! We left at 5:30 a.m. to go watch DD participate in a half-marathon! All righty folks - it's almost a weekend again! Wahoo for weekends! It's been 'meter read' week for DH, so I've had lots of time to craft! Again, resources are pretty limited, but I'm learning to cut great rectangles and squares!!! here's what I've done yesterday and today...remember, they are VERY simplified! If anyone has questions about supplies, let me know as I'm not going to list them tonight. Coloring on all projects was done with colored pencils and LOMS. I'm hoping to be making a trip to Scrapbooks Forever today - keep your fingers crossed!!! DH says he'll have time to drop me off and let me shop 1.5 or so! Once again, I'm with DH for a day or so, and have very limited resources. I found a challenge at Little Red Wagon that I could do with no problem! The challenge is to use a photo on our card/project. This photo is one that DD took of the Arch in St. Louis. Isn't it a wonderful photo? I could take a picture of the arch on a cloudy day, and that's what it would look like. She takes the same picture on the same day at the same time, and it's a work of art...go figure! The sentiment is an old stamp from Stampabilities. I use it often! Had to use StazOn Ink on the glossy photo. CS is DCWV. That's all there was to it!!! 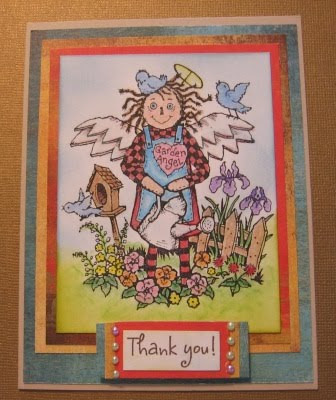 Are any of my blogging, scrapping, cardmaking friends from Branson, Mo.??? I've been traveling some with DH - he drives to Branson every single week for work. It's a 4.5+ hour drive, and I hate for him to do this week after week alone. So...I've volunteered (been drafted?) to come down with him a couple of times each month to help with driving, paperwork, driving, etc. Once I get here, I'm pretty much 'stuck' in a 5th wheel throughout the day while he works. I'd love to find a buddy who might come pick me up now and then to craft, shop, shop, craft, etc... let me know if you live nearby! When I'm here, our camper is parked at Holiday Hills Resort's campgrounds. I've heard there is a fabulous scrapbook store on the strip, but haven't been able to check it out! I brought a few stamps and some CS and DP - I think I'll play tomorrow! The challenge this week at Stampin' Sisters in Christ is brought to us by our own PeggySue, who has chosen John 10:10 as our scripture for the week. 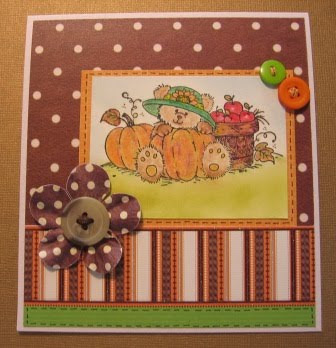 "Use real or faux stitching, etc., somewhere on our card or project." I love faux stitching, and as you can see, I've added it everywhere! 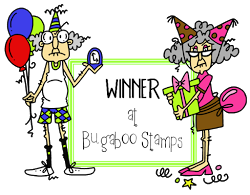 As our sponsor this week is Simon Says Stamp, I've chosen to use an image that can be found at their fabulous on-line store. You can find C.C. Designs, Nora on a Swing, here. I thought this image was perfect for depicting an abundant life. What could be better than spending an afternoon in all of God's beauty swinging in the breeze, with beautiful butterflies, leaves, and blue skies all around you? I like to think that when the scripture above refers to having life more abundantly, it's almost like a life 'upgrade'. For example, we can go to the car dealer on the corner, and purchase a 1970 pickup truck for $100. It will probably get us to our location. However, if we could buy a 2011 Lincoln MKZ for that same $100, it would still get us to our location, but we'd have a bit comfier, and probably much more enjoyable and reliable ride to our destination! When we are born, we are given life, but when we accept Christ into our lives, our life becomes much more abundant. Thanks, PeggySue, for really giving me some food for thought this week. This was a very interesting verse when studied from beginning to end. For this week's full devotional by PeggySue, and for all of the challenge details, please visit the Stampin' Sisters in Christ Challenge. 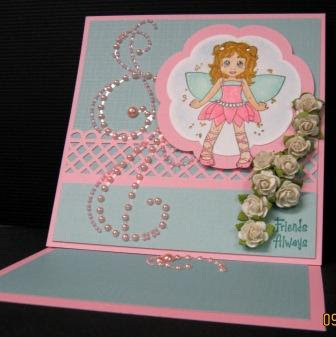 Supplies Used: Bazzill Cardstock, EK Success Border Punch, C.C. 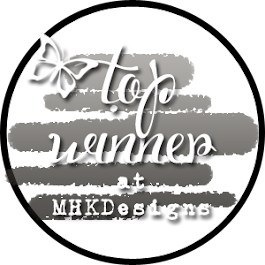 Designs Image, Ribbon and Flowers from Michael's, Koh-I-Noor Colored Pencils and LOMS, Zig Millenium Pen for 'stitching'. I love Dr. Seuss! Always have, and always will. When the kids were young, we had Green Eggs and Ham, and other books totally memorized, as did the kids! So, when The Angel Company came out with this travel set, and had a sentiment from Dr. Seuss included, guess who had to buy it? Anyway, here I am cutting and mounting, and I open up Crafty Creations Challengs. AHA! The challenge this week is "Transportation". Okay, peeps, I've got it made in the shade for this one! However, I was also in the camper, where there are very limited resources! I was able to stamp, but had little else to work with, so I stamped, and stamped and stamped! Instead of coloring, I paperpieced the vehicles! Found a scrap of ribbon in my bag, and made a road. Voila, a transportation card, while sitting in a transportation vehicle. 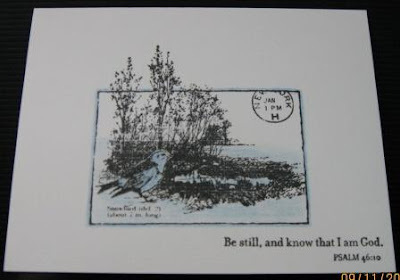 This next two cards are made with a new TAC set as well, "Peace, Be Still". I love the gentle and serene nature of the stamps. This is for Fresh Brewed Designs, where the challenge is simply "Brown". It is. I've not added a sentiment, as I'm not sure who's getting this one. I'll add it when I decide! All righty, off I go. Have a bit of housework to do before heading to church for some great singing! Take care everyone! Actually, I guess my title should be rainy DAYS in Missouri! Goodness, has it ever rained! It should make for a gorgeous fall, though. The leaves will be every shade of beautiful! 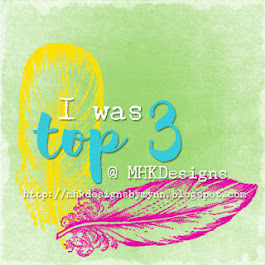 I have a quick post today. This card is for the Inky Impressions Challenge. The challenge was to make an easel card, and it's over tonight at midnight eastern time, so I am livin' on the edge, for sure! 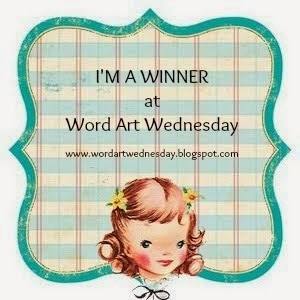 The prize for this challenge is a spot as a guest designer at Inky Impressions - now, you tell me, how much fun would that be??? Hope your week's been awesome. We are almost at another weekend! There's a special singing at our church tomorrow evening that we are very much looking forward to. It's a benefit for our minister and his wife who were married the last weekend in June. They flew to Calif. for their honeymoon where she became terribly ill and had to have an emergency hysterectomy. Of course, the insurance was not yet in effect, so their financial situation is pretty grim. Bills are in excess of 100k already, and still accumulating. YIKES! I just looked, and my blog will be two years old in fifteen days! Be watching for yummy candy! I hope that you have all recovered from your long weekend, and have the kids back to school, hubbies back to work, and finally have some time in your paper caves! I'm actually at work with DH this week, so won't have a card to post until Friday. However....I do have a fun photo to share with you! This photo is of our DD, while enjoying her day Labor Day! A group of folks, including DD, went on a float trip Monday. At some point during the day, a butterfly actually landed on her, and stayed on her for several minutes. A friend made a sudden movement, scared it away, and she thought it was gone. After a very short time, it came back and stayed on her hand again for several minutes. I'd love for you to read her "newly syndicated" (YAY!!!) blog entry, to get the story first hand, as she tells it much better than I do! Be sure to say hello while you are there! Have a great Weds. and Thurs., and I'll see you again on Friday! In case you can't tell by the speediness of my blog entries, I'm helping DH again this week! Hopefully, I'll still be able to get around to say hello and to ooh and aah over your pretties this week! This first card is for Flutterby Wednesday. 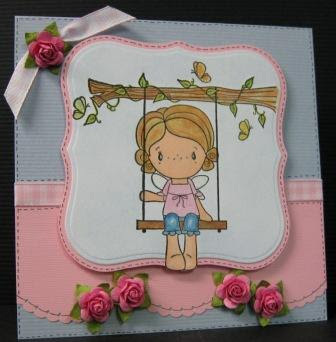 We were to use a fairy, butterfly, or angel on our cards, and....this week, a sketch was featured. 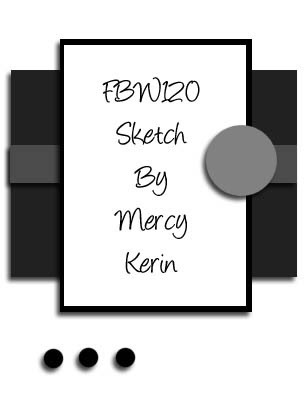 And not just any sketch...a sketch by the fabulous Mercy! 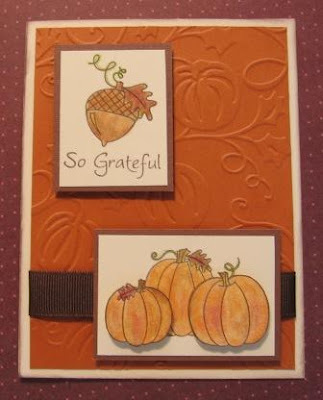 For my card, I used Kraft CS, DCWV Mat Stack, Glossy Accents, and TAC True Beauty stamps. I added a bit of color with my colored pencils and LOMS. The ribbon is from Michael's. I distressed with Tim Holtz Distress Inks, Antique Linen and Vintage Photo. Easy Breezy! Supplies: Image by Anita's "Sugarloaf" Stamps, Ladybug by All Night Media, Palette Noir Ink, Ribbon from Michael's, The Paper Studio DP. I have one more picture to show you. My friend, Shirley, has this amazing DH who can make just about anything you might want for your craft room! He's been making us these holders for our Stickles. This one is made from Cherry wood, as that's what he had on hand, but he can make them out pine, etc., as well. As shown, he is selling these holders for $5 per tier plus s/h. If you have TONS of Stickles, and need it to hold more per row, he can do that, it may just cost a bit more! Sure wish I'd have invented Stickles! I know you can't see it in this picture, but Rudolph has the most precious red, glittery nose! Hope Rudolph brings a smile to your face! Supplies: TAC Winter Tags, Offray Ribbon, The Paper Studio DP, Bazzill CS, Brads from Michael's, Red Stickles, Black Glaze Pen, Starburst Glitter Pen, Palette Noir Ink, Koh-I-Noor Pencils, LOMS, Baby Blue Copic, Image stippled with Stampin'Up Bashful Blue. It's time for another challenge at Stampin' Sisters in Christ! Jesus answered her, "If you knew the gift of God and who it is that asks you for a drink, you would have asked him and he would have given you living water." Jesus answered, "Everyone who drinks this water will be thirsty again, but whoever drinks the water I give him will never thirst. Indeed, the water I give him will become in him a spring of water welling up to eternal life." 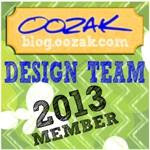 This is my first week as a design team member with Stampin' Sisters in Christ. I'm very happy to be a part of this wonderful group of ladies. Each of them brings her own special talents, personality, and steadfast faith. I'm very much looking forward to spending some time with them! 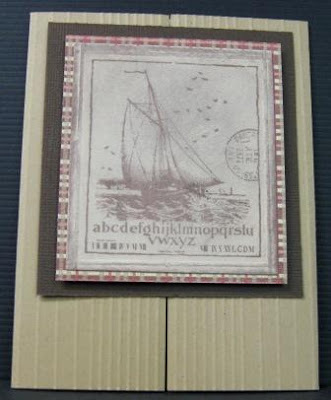 The stamp set I chose, was chosen because of the rippling of the water under the boat... I once read a devotional about how we are like drops of water, and how one drop of water by itself is insignificant. It doesn't last long, it evaporates quickly in the sun or wind. By ourselves, we won't last long either - we're made for fellowship with other believers. A drop of water that's put into a larger body of water will cause ripples, and become more significant. As more drops are put into the body of water, the ripples begin to overlap each other. The way that we influence others along life's journey, can have that rippling, overlapping effect as well, by our words and actions. Have a great week, dear friend, and don't forget to ripple! I am also entering this at: Alphabet Challenge Blog (S is for scallops). Stamps:The Angel Company, DP-DCWV, CS-Bazzill. All coloring is done with Prismacolor pencils and LOMS. An EK Success edge punch, and Kaiser Craft Pearls were also used. Hopefully, you are all getting ready to enjoy this three day weekend. The weather is absolutely glorious in Missouri today. Shall I report on local sports next? I have such exciting news that I can barely sit still to type it! I am the newest Design Sister at Stampin' Sisters in Christ!!! Seriously, I am so pleased to be part of such a special group of ladies. I've known some of these folks for a long time through this wonderful world of technology, and I am looking forward to getting to know the others in days to come. Send up a special prayer for me that I can keep up with this amazingly talented group! 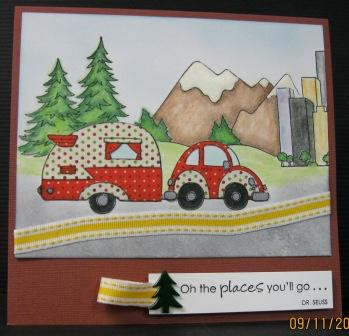 Be sure to pop over to Stampin' Sisters in Christ on Sunday morning for the new challenge! The challenge this week Paper Pretties, is sponsoring the "Oh Alice challenge". A little girl theme is to be used. I went to the Paper Pretties store, and found this adorable image. Perfect for fall! (Summer I miss you already!) I then remembered a sentiment that Paulette had posted a while back at Create with TLC, and thought it would be so right for this little gal! Image: Paper Pretties, Coloring: Prismacolor Pencils & LOMS, DP from a friend (in Tuesday's mail! ), Ribbon from my stash, CS: Bazzill, Cuttlebug, Blossom Nestabilities, Flower (to cover an oopsie) from JoAnn's Crafts, Stampin Up Bashful Blue Ink for sponging. Have a great Thursday - hard to believe it's already September! I needed a couple of note cards to send off in a hurry, and this set came to mind right away! My dear friend, Shirley, gave this set to me last weekend. Isn't she special? And isn't this stamp delightful??? Anyway, Shirley is an angel for TAC, and this set is called "Art Gave Her Wings", and I love it! The cards were super quick, and I actually cased them from this months PaperCrafts magazine, page 30! Hope you like them! It's month end at our place, so I will be literally buried in reports for the next two days. I'll try to check in on ya'll though!! !